Brown sausages in a large (high-sided) skillet. Transfer to a plate and return skillet to medium-high heat. Melt butter then add garlic, sweet peppers, onion strips and lemon pepper. Stir fry for 3-4 minutes until peppers and onions have softened. 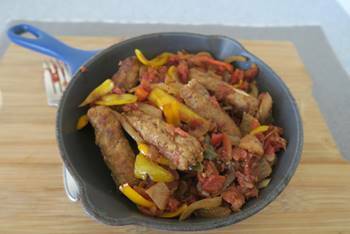 Stir in tomatoes and browned sausage; cook for an additional 2 minutes to heat tomatoes.